While the AICPA/FAF/NASBA Blue Ribbon Panel (BRP) on Private Company Standard Setting members have agreed that more attention needs to be paid to private companies’ problems with financial reporting standards, the 18?member body has not yet resolved how this should be accomplished. 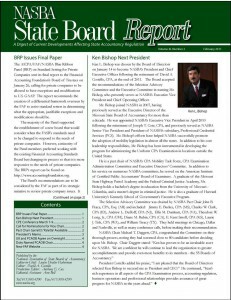 At the conclusion of the October 8, 2010 BRP meeting, staff members were directed to start drafting recommendations to be sent to the Financial Accounting Foundation. While AICPA President Barry Melancon led a group that stood firmly behind the creation of a separate private accounting standards board to set exceptions from U.S. GAAP for private companies, NASBA Chair Billy Atkinson, FAF President Terri Polley, Sun Trust Banks Senior Vice President Dev Strischek and American Accounting Association officer Teri Yohn maintained the Financial Accounting Standards Board could and should tackle the problems once appropriate people are dedicated to the task. AICPA Chair Melancon said. “To not move to substantive change and to say we trust that the FASB will make changes ?? that has been tried and it has not worked,” He said he would support a five?year sunset review for the proposed new board, as well as a checks and balances system over its operations. The BRP’s call for public comment on private company financial reporting resulted in 151 responses, and only 2 percent of the respondents were users of private company financial reports. The most common responses mentioned lack of usefulness and complexity of standards. Responses from the largest CPA firms did not favor separate standards nor a separate board. Responses from mid?sized to small CPA firms were mixed. Many respondents were also concerned about the funding of a separate board. Commenting on what had been said during the October 8 discussion, FASB Acting Chair Leslie Seidman told the BRP meeting: “I think I heard a plurality of views around Model 2 B [which would create a separate board]. I heard that the current board cannot deal with private company issues ?? but I still heard that the FASB should take the first shot and that the second board could be needed only if the first approach does not work. So you want Models 2 A [no new board] and 2B.” Ms. Seidman pointed out, “Without a common understanding of why we need differences in financial reporting ?? this is not going to work.” She said she would rather build the private companies’ concerns into the process of standard setting, rather than having them considered after the standard is completed. Mr. Strischek said, “At points in this discussion I almost felt like a marriage counselor ?? trying to figure out how to keep you all together.” He observed that, “Until the FASB is reconstituted, it is not going to be private?company oriented. I hope by the time the BRP meets in December much has been done.” The BRP will next meet on December 10 in Norwalk, CT.